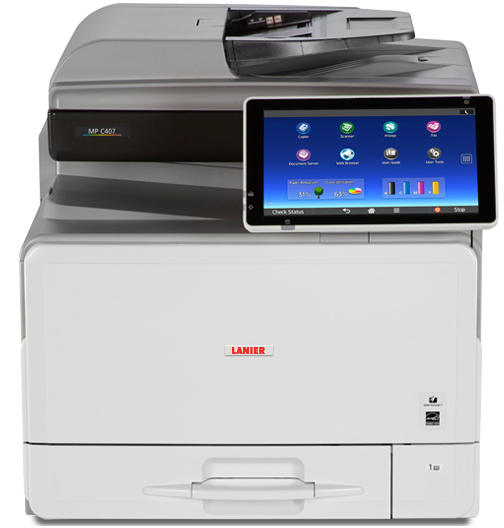 Empower your workgroups While the LANIER MP C407 Color Laser Multifunction Printer (MFP) may not take up much space, this workhorse packs in robust print, copy, scan and fax capabilities to help boost your productivity and efficiency. And with local storage and cloud capabilities, the MP C407 becomes your information management hub — bringing print and digital documents together as unified workflows to help streamline collaboration. Now, keep more jobs in-house as you produce a wide range of professional color output. Create professional-quality output in 1200 x 1200 dpi with crisp, clear text and photo-like images in brilliant color. Advanced print quality features help you consistently deliver professional-quality materials to leave the right impression with customers and elevate your brand. Black Over Print helps to mitigate defects in photos and other scanned documents. And adjustable color settings help to breathe colorful life into your output by making colors even more vivid. Digitize large volumes of documents for local or cloud storage with rapid single-pass document scanning up to 80 images per minute (ipm) for documents up to 8.5%uFFFD x 14%uFFFD. PageKeeper models include a multi-feed detection sensor to help avoid delays and errors by automatically stopping a scanning job if more than one sheet is fed through the feeder. Now, you can easily make digital and print information readily available by email, cloud or your preferred collaboration apps. Speed means little if your MFP isn't backed up by enough processing power to avoid user frustration and delays. The MP C407 comes with a standard INTEL 1.46 GHz processor that packs enough power to handle large, graphics-intensive files. Standard 2 GB RAM allows the MP C407 to process multiple jobs at once, so you can get more work done in less time. Keep up to 3,000 documents on the standard 320 GB document server (hard drive) to be scheduled, locked or held for fast printing. Workloads increasing? Expand the standard 100-sheet capacity to 200 sheets with an optional 100-Sheet One Bin Tray, which also separates print and copy or copy and fax output for fast, easy document retrieval. The standard Gigabit Ethernet interface lets you to connect to high-speed LAN to help avoid bottlenecks due to slow data transmission. Print directly from your smart device by joining the same network as the MP C407 and using AirPrint® for iOS devices and Mopria™ for Android devices. Or download the LANIER Smart Device Connector App to initiate print, copy and scan jobs from your device. Also, print from and scan directly to cloud storage. Users can connect to the MP C407 via NFC or QR code without going onto the corporate network. Now, painlessly share presentations or print materials for meetings. Enjoy a tablet-like experience on the latest generation 10.1" Smart Operation Panel, with intuitive navigation and easy customization. Find information quickly and accelerate workflows with shortcuts — including personalizing three persistent shortcuts at the top left of the panel. Simplify document creation with convenient previews in which you can configure detailed layout options. Additionally, change the look and layout of your user interface to match your preferences. With an ENERGY STAR® certified, low Typical Electricity Consumption (TEC) of just 1.8 kWh and 8-second recovery from Sleep Mode, the MP C407 helps your office save on energy costs without cutting into productivity. The MP C407 is EPEAT® Gold rated. Further reduce costs by using less paper with standard auto duplexing (two-sided printing). Recycle toner cartridges through the Cartridge Return Program to help maintain a low environmental impact. Help safeguard your proprietary documents from theft and unauthorized access by managing and tracking what users print, copy or fax from the MP C407's document server. Enforce security policies for user access with passwords, billing codes, QR codes and an NFC card reader. The document server can encrypt data and erase latent images with Data Overwrite Security (DOSS). If you need to share sensitive information, you can easily create encrypted PDFs.